Unnati Akhouri is a 2017 Inlaks Scholar. The post below was part of her Thesis for the completion of Masters in Mathematical and Theoretical Physics at the University of Oxford under Dr. Lucian Lang. Today we venture into the world far away yet far within us; the world of the subatomic. For that, we need the travel pass of the Standard Model to board the circular beams at the Large Hadron Collider, undisputedly one of the most glorious feats achieved by mankind. The Standard Model of Particle Physics (claims) to describe everything we know about the universe in a humble list of 12 fundamental matter particles (and their antimatter counterparts), 4 force carrier particles which describe all the interactions of this universe (maybe excluding the attraction one feels to dumplings!) plus a Higgs which describes the mass mechanism. While each particle in itself has a fascinating and dramatic story to it, today we focus on the set that makes you and me, namely the quarks and electron. Indeed, it is the proton (and neutron) that we are concerned with, it is made up of 3 fundamental point-like particles called quarks; 2 up and 1 down quark. But surely we cannot be satisfied by a word of mouth or an equation of hand, which is why we turn to the LHC for verification. Observation is at least partial Validation. 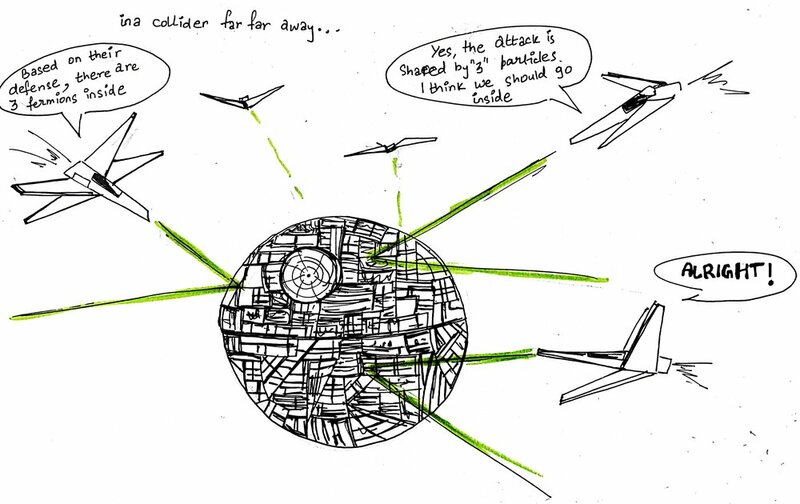 Turns out, this is not what we observe in the LHC, but we already knew better than that! The proton is, in fact, divisible and if you believe the theorist, they would (after having a “I told you so..” moment) would remind you of the 3 quark sub-structure of the proton. If that is the case, we expect that each attack/hit of the electron would be taken by 1/3 of the proton and owing to the push-pull between the 3 siblings living inside, a data set of form (b) would surely be typical with a peak at 1/3. Lo Behold! This is not what we observe either! 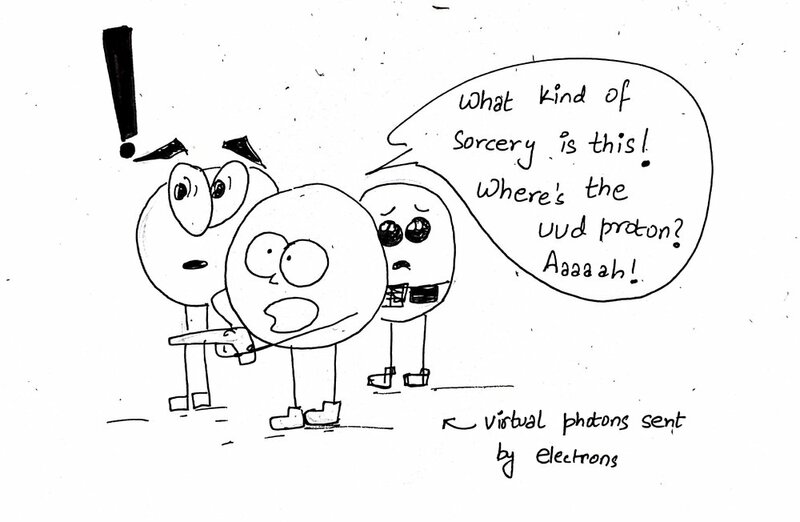 When the electrons fired at the proton, the photons saw something that was bewildering to them and us alike! The proton did not comprise of a three-body quark system, but rather a sea of quarks popping in and out of existence while overall maintaining the correct quantum numbers. On further investigation, the photons that had breached the proton structure reported that a quark would spontaneously give birth to another quark plus a particle the photons couldn’t quite recognize. The theorists came running claiming that the mother quark with high momentum, and thus high energy, was indeed giving birth to another quark, because hey E = mc^2, plus a force carrier, the gluon which was hidden from the eyes of the photon. Intuitively, this meant that the quarks would have lower momentum since the energy now had to be distributed among more of them. On data, this meant we saw an archetypal plot of the form (c) where the hit of an electron was mostly taken by particles that were now a smaller fraction of the proton. This was the Quark Parton Model given by giants like Feynman, Bjorken, Callan etc where electron-proton cross-section i.e. the attack of the electrons, could be enumerated as a function of the fraction of momentum carried by each type of quark and the probability of each type of quark at a given energy scale, called the Parton Distribution Functions. More theoretical and experimental work showed that things were more complicated as we got more precise. Recall that we had the suspicious looking particle called the gluon, which the photon could not directly identify. Turns out that this gluon goes around doing funny businesses by radiation on and off quarks and thus affecting the momentum distribution and subsequently the Parton Distribution Functions. These functions now also depend on the probability of a quark radiating off a gluon etc. that in itself depends on the energy at which the experiment is studied. At the LHC, phenomenologists concoct initial parameterisation based on our theories at an initial energy scale V, including initial quark by number content inside a proton which they then evolve using simulations to a higher energy scale Q based on equations known as DGLAP equations and finally fit them against the data from the ATLAS experiment collected at energy scale Q. These fits stand as a decisive test for our fundamental theories including the Standard Model and any deviations imply a need for ramification i.e a theory more finely tuned to our Universe. Caveat: This is a comically simplified version of the magnificent math developed by theorists over the years to lead us to get a glimpse of the unknown and the fundamental going hand in hand with the ingenious works of engineers and physicists alike at CERN who made the LHC experiment possible. This is in no way the fundamental and in fact, the truth is a renormalization flow equation, where everything we claim to be true changes with energy scales which just means new avenues are always awaiting us! The hope is that we keep our minds open! If this sort of Physics interests you find me at www.fatalphysics.wordpress.com explaining the world of the smallest in elaborate cartoons!